Hi, I’m traveling for 17 days. Can you extend two days? I really need one by the 19th can I habe one by then? I was trying to see if i can book to have for july 29-aug 15. It said use contact form. I don’t know where that is. I was trying to figure out the cost to have it for my flight july 29 and i fly home aug 15. thank you. Hi Jenni, I sent you an email. Have a good day! Hi Lauren, i just sent you an email. How many CARES do you have in ‘inventory’? My wife and I have triplets and will be travelling next May and I will need three harness. We have enough to accomodate you. Hi, my flight leaves July 25 and returns on July 28. Should my rental dates start the day before and end the day after? Or does that matter? Hi Mitsi, it should start on your departure and end on your arrival date. I’m traveling with my 2 kids from July 3rd-July 23rd is it too late to rent them? Not too late 🙂 sent you an email. That is a good idea to get rid of deposit. Your website is pretty convenient! Hello, I will be traveling from Oct 28- Nov 18, 2014. I would like to know if the deposit is refundable and I live in California I was wondering if you could give me the full amount I would pay with tax included. Thank you. Hello Ashley, sent you an email with the price. Have a good night! Wondering if I could still get it in time for July 22 departure. Is there a shipping charge to return also? Hi Maricela, sent you an email. I need one by 24th july. I have trip from 24th july – 6 august. I am trying to reserve for 8/21 -9/7 and am having difficulty using the website. Is there another way for me to book this or am I unable to reserve a harness for this time period? Thank you for your help with this! Hi Beth, I sent you an invoice. I leave on the 19th. Is there time to still receive? yes, sent you an email. So relieved to have found this website! I’m traveling on November 13th. Is it too soon to inquire about renting a CARES belt now? I leave on 12/12 early am- when should i expect to be receiving? It is scheduled to be shipped on the 4th. A shipping confirmation will be sent to you with tracking information. No… you’re not the only one, but I like your operation better 🙂 Happy new year’s to you and yours. According to the company’s website, there is no minimum age limit for using CARES. It is designed for use only by children who weight 22-44 lbs and whose height is 40 inches or less and are capable of sitting upright alone. Nothing is 100% safe. The harness should be sent to us within 7 business days from the date of your return. I recommend you use USPS Priority Mail as it takes 2-3 days to get to me and is a lot cheaper. We charge a late fee of $11.95 per day, per CARES starting on the 8th day (max $83.65). It is considered “default/stolen” on the 16th day and this will incur more charges. Hi Brandi, we do but it is still out.Estimated return date is April 30th, it might not make it to you on time. Hi, we are traveling early sunday morning, 8/16. Is it too late to order these so they arrive saturday? We do, but it is currently still in use. When would it be available to ship? I’m not understanding what “partially booked” means, so I’ll just ask; I need one by the 6th, & its a one-way flight, so I would be returning 2-3 days after our arrival. Is that possible? Hi Tracy, I sent you an email. Hi I just found your site. I am in San Diego, how long would shipping take? Hi Porsha, regular shipping takes 2-3 business days, this is not guaranteed. Express shipping takes 1-2 business days, guaranteed. I wanted to rent the cares harness for my 2 kids but I am tea selling for 2 months from USA to India . What will b the roundrtripcost of the same . Can I return it back from India if I consider renting one way . Do you ship to vietnam ? It would be return when we get back to the new york . Hello, I live California n I am traveling out of the country OK in March 8 n returning 3/23 ,how much would it cost? $18.40 is the grand total. Please use the calendar to book. I read a response where you stated the harness is for use with children up to 40 pounds. My grandson now weighs 43, and we won’t be traveling until April. 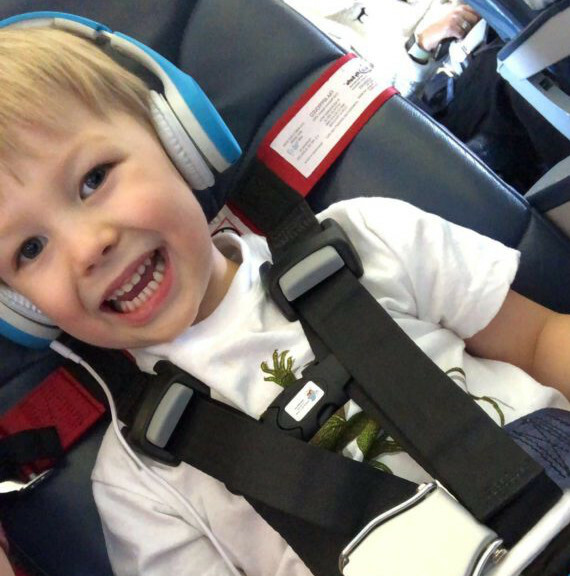 The airlines says a harness is needed for children up to 44 pounds. If yours only goes up to 40 pounds, and they require one for up to 44 pounds, are there other sizes or alternatives available for children over your 40 pound limit? This was my response: According to the company’s website, there is no minimum age limit for using CARES. It is designed for use only by children who weight 22-44 lbs and whose height is 40 inches or less and are capable of sitting upright alone. Cares harness currently has 2 sizes, one is the one I carry and the other is for special needs. Hi, I placed an order earlier this evening however I don’t see a confirmation email. I’m just wondering if the payment went through. You can reach me via email. Thank you. Hi! What an awesome idea! We are flying to Europe. Can I rent CARES and go outside the United States? Thank you. Yes, as long as you’re coming back to the US. How much is the cares harness? They range from $39-$44, but they are all sold out. Hello, I’m going on a trip on June 17 until July 1st. I’m looking 2 get two Cares Harnesses and would like to know if the grand total includes the $6.00 shipping how much does it cost us when it’s time to ship back? Do we have to pack it in our own packing or is that provided by you? I reserved a cares harness for my 3 year old. We leave out on Monday May 30th. Can you e-mail me or let me know here if it was sent out yet? Hi Loretta, this went out on the 20th. You should have received an email with the tracking info. I will resend it right now. I am traveling June 17 – July 7. Is it too late to rent one? If not, how much for one harness? Thanks! Hello, I placed an order and I have not received the email confirmation. It is not in the spam or junk folder. sent you a reply via email. I’d like to rent a harness for Jan. 11th-21st, but I don’t understand how I’m supposed to return it to you? Is the return shipping included in the price?